Protecting personal information is the new normal, and personal data privacy will be the most prominent issue affecting how businesses gather, store, process, and disclose data in 2019. Gartner includes data ethics and privacy on their list of the top 10 strategic technology trends of 2019, placing it on the same level as AI-driven development, blockchain, and edge computing. Businesses have been inundated with information on what recent privacy laws like GDPR and CCPA require, but many are still trying to figure out how to comply with them on a practical level. Many companies are focusing on data privacy from the legal and security side, which are definitely foundational, but are missing the focus on data. The good news is that these data privacy regulations compel businesses to get a handle on personal data — how they get it, where they get it from, which systems process it, where it goes internally and externally, etc. In other words, the new norms of data privacy require proactive data management, which enables organizations to extract real business value from their data, improve the customer experience, streamline internal processes, and better understand their customers. Join Primitive Logic at our next webinar, where we'll bust the most common myths about data privacy as we show you how to adapt to the demands of our current environment and prepare for what lies ahead. As more organizations adopt a cloud-first strategy, the task of migrating high-volume transactional workloads presents a unique set of challenges, particularly in handling the large amounts of data involved. Join Primitive Logic and Actifio as we discuss the most pressing challenges around transactional data migrations … and the solutions that can help address them. Now that the GDPR is in force, the compliance training your team received is a vitally important part of their day-to-day activities. So, how do you make sure your employees remember what they learned long after the training has ended? Where organizations are today with GDPR compliance. How we’re using gamification to help GDPR clients make learning stick. Join Inxeption’s David Judd and Primitive Logic’s Ethan Silvers as they discuss the important role of product digitization on B2B sales and marketing as a way to future-proof your business. Learn how blockchain can allow you to quickly react to market changes by connecting your digital asset and marketing systems to your product delivery supply chain. Unplanned machine downtime can disrupt operations, diminish employee productivity, and generate high costs for emergency repairs. IIoT devices offer an effective solution by transmitting data on temperature, vibration, friction, and other factors, enabling you to detect potential failures ahead of time and repair or replace equipment proactively. Even though the GDPR enforcement date is here, it’s never too late to get on board and start assessing your data processes to begin aligning with the requirements. And even if your company is already prepared, May 25 is not a finish line. Not only will the regulation itself continue to be clarified through interpretation, but certain triggers in your organization down the road will require a re-evaluation of your compliance status. Getting your company ready for GDPR isn’t about putting a few new processes in place — it’s about rethinking your entire approach to personal data, including how to get value from it. For decades, companies have collected and stored all kinds of personal information “just in case” they ever needed it. GDPR requires a different approach. You need to be proactive in thinking about how to get value from your data, and you need to understand exactly what your company is doing with personal data and why. - How does GDPR change the way security is approached by both Internet application developers and security professionals? - What are the rights provided to data subjects by GDPR and how does this change the way Internet business applications must be designed and secured? - How can organizations demonstrate the GDPR requirements for Article 25: Data Protection by Design and by Default? Regardless of your geographical location, if you handle EU residents’ personal data, you also need to provide mechanisms that allow an individual to exercise the rights that are afforded by the GDPR. The ability to search, discover and review and delete data is a critical component of GDPR compliance. But if that data is stored in multiple systems, and potentially shared with multiple partners, the tasks become dramatically more complex – requiring the technological ability to find and address all affected data promptly. All of these rights require a new level of enterprise-wide data mapping, data governance, data architecture and system management. Join Primitive Logic’s technology solution experts in a conversation about how to address Subject Access Requests from the technology perspective. Join this conversation between Primitive Logic’s technology solutions experts and Latham & Watkins’ Privacy and Data Protection legal expert to understand GDPR key points and technical solutions to help your GDPR readiness. - What steps do you have to take to address the expanded definition of Personal Data? - What do the Privacy Rights given to data subjects mean for your digital data governance solutions? In today’s world, every company is a digital business. A successful digital transformation starts with understanding what you want to achieve—and that begins with understanding your customer experience. This presentation shares examples of how you can quiet the noise of the rapidly evolving technology landscape with actionable, implementable solutions that generate lasting business results. Innovation happens at the nexus of different disciplines, and webinar attendees will learn how to solve today’s most pressing challenges by combining digital strategy, experience design, and technology. DevOps 2.0, also known as BizDevOps, is the next iteration of DevOps that brings the benefit of continuous feedback and rapid application deployment to both business and IT. The end result is the ability of the business to deliver new functionality according to their schedule as opposed to that of the development and operations teams. In this webinar you will learn about the benefits, techniques, technologies, challenges and best practices to adoption and execution of DevOps 2.0. 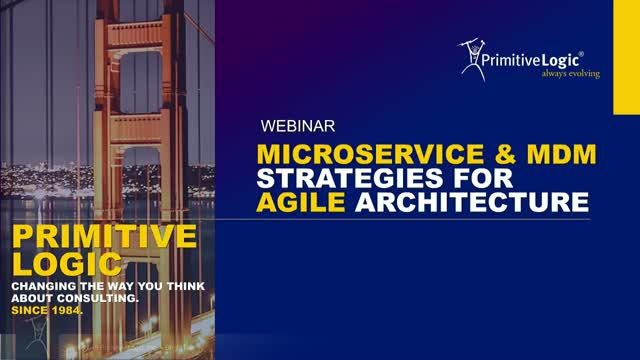 This topic will focus on how small and mid-sized banks can focus on owning and managing key customer touch points in an efficient manner using a microservices pattern. It will demonstrate how to leverage 3rd party commodity services without being locked into a vendor’s platform. This presentation details how to leverage technologies such as Hadoop, MapReduce, Pig and Sqoop to massively scale cloud integrations to services such as Salesforce.com. Attendees will learn how to overcome API limitations, throughput latency and infrastructure scaling challenges to significantly increase integration performance. Primitive Logic has been solving large-scale, complex digital business strategy challenges for over thirty years. Our solutions are designed to evolve with an ever-changing digital landscape. What makes us different? Primitive Logic’s unique, time-tested approach applies mindfulness to digital transformation. Cut through the noise to empower your business to thrive in the rapidly changing digital world.